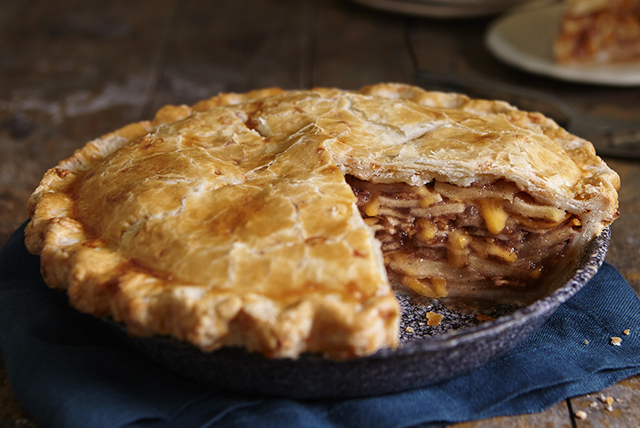 This classic combo makes the perfect pie -- flaky, tender pastry atop tender and tart apples. Best part? Ooey, gooey melted cheddar cheese hidden in the filling and the crust! This apple pie recipe is a must-try! Combine 2-1/2 cups flour and salt in large bowl. Cut in butter and shortening with pastry blender or 2 knives until mixture resembles coarse crumbs. Stir in 1/2 cup cheese. Combine water and 2 Tbsp. lemon juice; add 1 Tbsp. at a time to flour mixture, mixing lightly with fork after each addition until flour mixture is evenly moistened and clings together when pressed into ball. Divide dough in half; shape each half into ball. Flatten slightly. Wrap individually with plastic wrap. Refrigerate 1 hour. Heat oven to 425ºF. Combine sugars, cinnamon and remaining flour. Toss apples with remaining lemon juice in separate large bowl. Add sugar mixture and remaining cheese; mix lightly. Roll out half the dough on lightly floured surface to 11-inch circle. Place in 9-inch pie plate; brush edge with some of the egg. Fill with apple mixture. Roll out remaining dough as directed; place over apple filling. Seal and flute edge. Cut several slits in top crust to permit steam to escape. Brush with remaining egg. Bake 50 to 55 min. or until juice begins to bubble through slits in crust, reducing oven temperature to 350ºF after 15 min. Cool. To prevent pie filling from bubbling over the edge of the pie plate and onto the oven floor, line the lowest oven rack with a sheet of foil before preheating the oven to catch any pie drippings.